Authors: Edwin L. Miller, Jr.
Getting mergers and acquisitions transactions successfully completed requires an understanding of the legal framework, negotiating points, and practical aspects of each stage of the deal. Part legal primer, part business and negotiating primer, Mergers and Acquisitions: A Step-by-Step Legal and Practical Guide provides comprehensive and understandable advice for management, investors, legal and business professionals, and law and business school students. 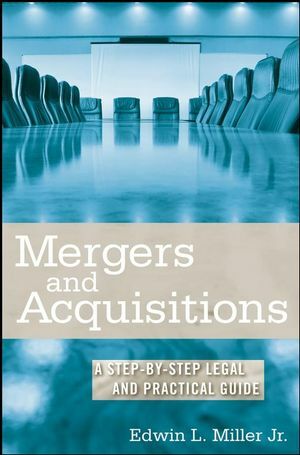 Mergers and Acquisitions is a must-read whether you’re a legal or business professional, an entrepreneur, an investor, or a law or business school student. The book will also be extremely useful to international lawyers and businessmen who need to understand the M&A practices in the United States that are being increasingly adopted around the world. Chapter 2. The Acquisition Process. Stay Bonuses And Other Employee Retention Arrangements. Business And Legal Due Diligence. Chapter 3. Corporate (Non-Tax) Structuring Considerations. Business Objectives, State Law Concerns, And Other Structuring Considerations. Subordination Terms And The Analysis Of The Risks Of Holding Debt. Successor Liability And The De Facto Merger Doctrine. Employment Agreements And Non-Competition Covenants. Taxable Versus Tax-Free Transactions: Overview Of Relevant Situations. Detailed Analysis Of The Positions Of The Target And Its Owners And Of The Buyer. Taxable Transactions And Their Tax Effects. Chapter 5. The Definitive Acquisition Agreement. Survival Of Representations And Indemnification. Chapter 6. Acquisitions Of Public Companies. Public-To-Public Mergers: What Is Different? Case Law-Developed Fiduciary Duties And Standards Of Review. Securities Laws And Public Company Acquisitions. Chapter 7. Leveraged Buyouts (Structural And Tax Issues) And Acquisitions Of A Troubled Business (Creditors’ Rights And Bankruptcy). Leveraged Buyouts: Structural And Tax Issues. Acquisition Of A Troubled Business Generally.